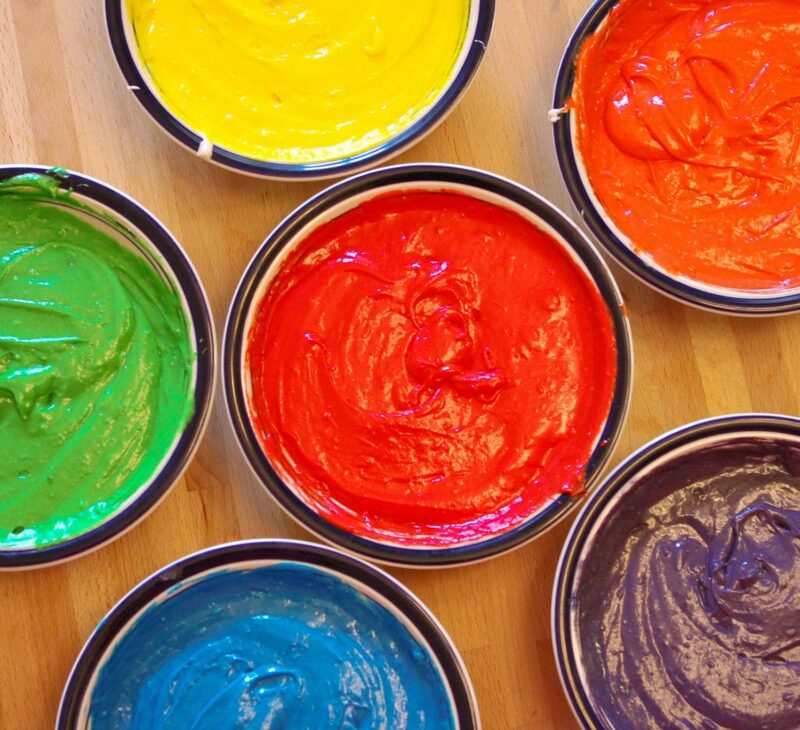 Making a rainbow layer cake or cupcakes is easier than you think! Have fun with the family and create this masterpiece in your kitchen this weekend. One of my absolute favorite things to eat is cake. I have always loved celebrations of every kind because most of them involve cake. White cake, chocolate cake, marble cake, German chocolate cake, lemon cake. When I thought about what I wanted to post on Chef Dennis’ blog, the first thing I thought of was cake. I am simultaneously celebrating one year of food blogging, so nothing sounds more fitting! So rainbow cake it is! This was my first attempt at a rainbow cake, and let me just say that it involved a bit of trial and error. Fear not, though. None of you will have to endure the same learning pains that I did. 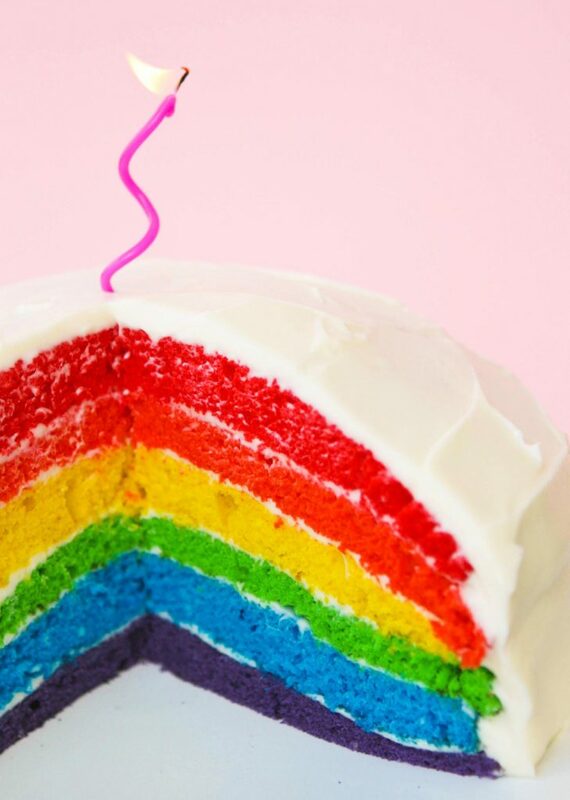 I will tell you exactly what you need to do in order to create this beautiful rainbow cake! Due to the “trial and error” that I referred to, I had extra batter and extra frosting. I had a little bit of fun with it, and it made my 4-year-old squeal with delight. I was lucky to snap this photo because his eager little hands were within inches of the frame, ready to grab that pretty cupcake for himself. Thanks for sharing this perfect article. Minimum time is required, It is too easy!!!!!!! Thanks for the feedback, I’m happy to hear you enjoyed the recipe! Fab guest post. I have sen this cake occasionally on other blogs, this is the nicest one. It’s stunning. Holy wow! This cake is the show stopper! I would ate to be the person who has next Friday. There is no topping this one! The photographs on Pip & Ebby are wonderful and the recipes sound fantastic. This is a wonderful guest post. And – I’m loving the break from all the rain finally! The sunny weather is great! This cake is so gorgeous and fun. I need to invite some nieces and nephews over so I can make this. It’s just too cute for words. Congrats on being featured here Megan. Very well deserved. 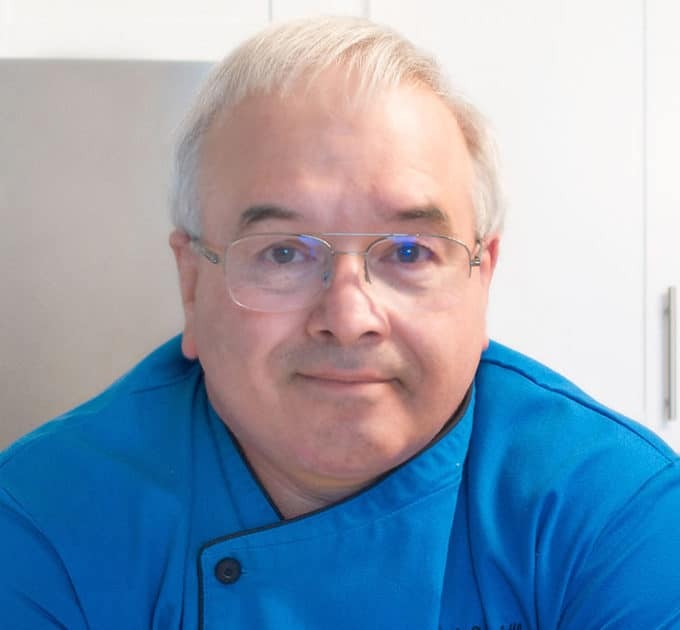 Chef Dennis- I am happy to hear you are back into the swing of things with the girls. I agree about the weather. We just got a white puppy- what was I thinking? Lol! Enjoy your week. What a beautiful, colorful cake! 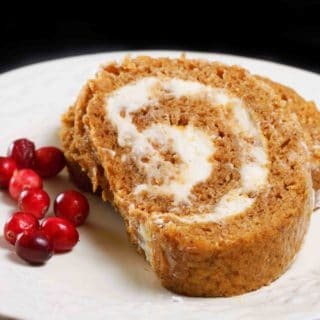 It looks absolutely stunning and yummy, not to mention moist too! Plus, beautiful presentation with the single twirled candle in the centre. Gorgeous. Wow! Since I have once seen a picture of a rainbow cake (sans recipe, just the pic) I wanted to make one myself! I cannot imagine how great the suprise would be for someone to slice a plain white-looking cake and found it was indeed anything else but plain! 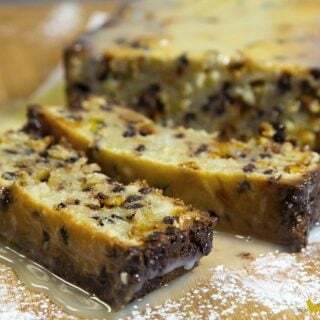 😉 Great recipe and thank you! Wow, That looks so beautiful.. This cake is so very pretty. Thanks for introducing me to Pip & Ebby’s blog, I love it. I’ve barely checked my reader at all over the last couple of weeks. So, I was happy to remember as I was cooking dinner tonight that you’d have at least a new guest post and (YAY!) a couple more as well. I’m glad I checked. Have a wonderful rest of the weekend, Chef Dennis. That cake is awesome! It looks much harder than it is! Love this post! Happy 1 year anniversary to one of the most fun and clever bloggers out there. I always enjoy reading Megan’s stuff and this cake is a great example of our exciting and colorful her blog is 🙂 Thanks for hosting her, Chef Dennis! This cake ROCKS! And I thought it was going to be a much harder process than these excellent and easy instructions! I love the cupcake, too 🙂 Thank you so much, Dennis and Pip! These looks gorgeous, and the photography is amazing! Well done chef…but honestly; too much food coloring for my taste 🙂 I would rather a plain old vanilla sponge with some crumbs on it. What kid wouldn’t love that!? Such bright colors and so playful. That is one colourful cake. Not sure I can get into eating blue or purple, but I’m certain the kids would love it. I have been seeing so much of these rainbow cakes around…they look like so much work but Pip & Ebby makes it look SO easy! I always love visiting that blog. Going to the Penn State game this weekend Dennis! So excited about it! Have a great weekend! What a cheery and bright cake! And a perfect way to celebrate a blogoversary =) Love Pip & Ebby! This cake is an exquisite work of art and labor of love.. Gorgeous pictures! What a complete delight this post is! I’ve loved these cakes on Pinterest and marveled at how one could construct one! Thank you Megan for breaking the code. The cupcake is absolutely to die for. Jerry Garcia would come back from the dead for that one. Devistatingly darling! Thanks you two for a perfect post to kick off the weekend! Oh I love this! How can a cake that I can’t eat make me so happy?! Well I would say that this post was timed very well! Your rainbow cake has added a little sunshine in the rainy days at Chef Jeff’s place. I will gladly take the cake as well as the rain! This is one of the best surprise cakes I have seen. Looks like a regular cake on the outside but one cut reveals brilliantly colored layers. You did an awesome job on the layering. looks so vibrant and yum!! So so cute! 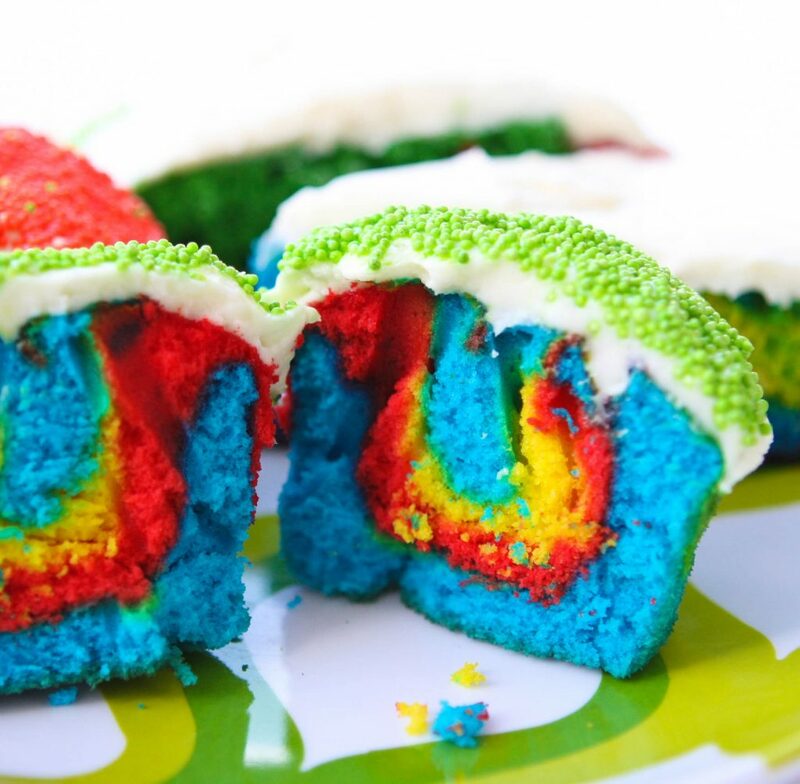 I love rainbow cakes! Stunning cake! 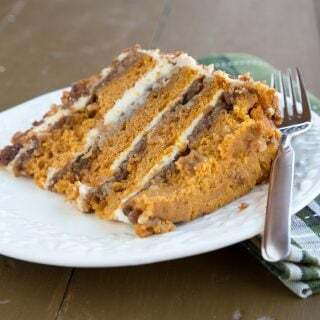 I bet whenever you serve this and cut into it there are “Oohs” and “Aahs” every time! Headed to your site now! Congratulations on a great guest post! 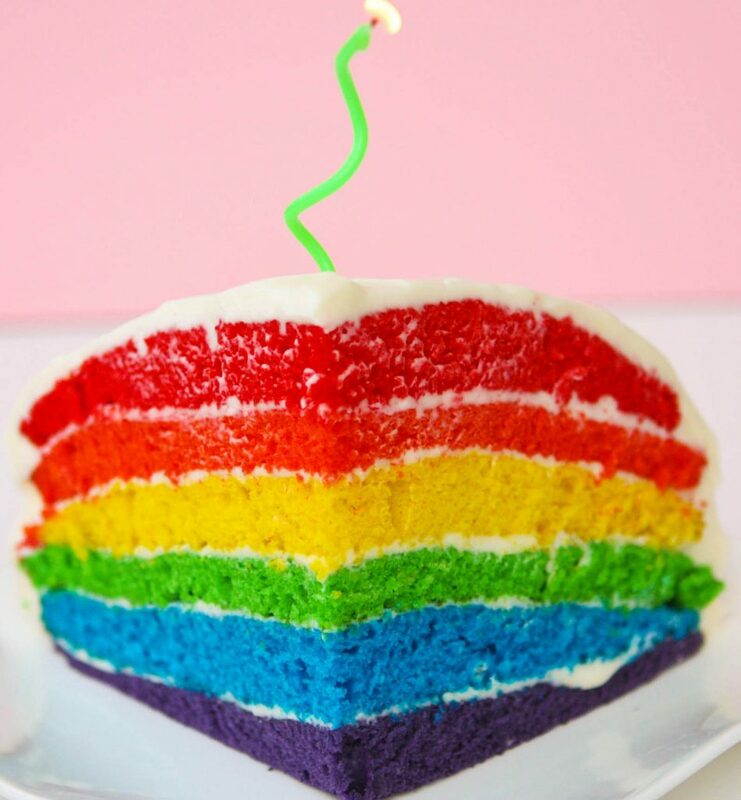 I love this rainbow cake! It’s so bright and cheery!! So cute, this would be perfect for a kid’s party! I don’t know which I like more, the cake or the cupcake version?!? Great post! How beautiful! 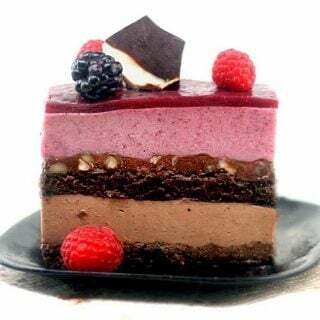 It’s happiness in a cake! 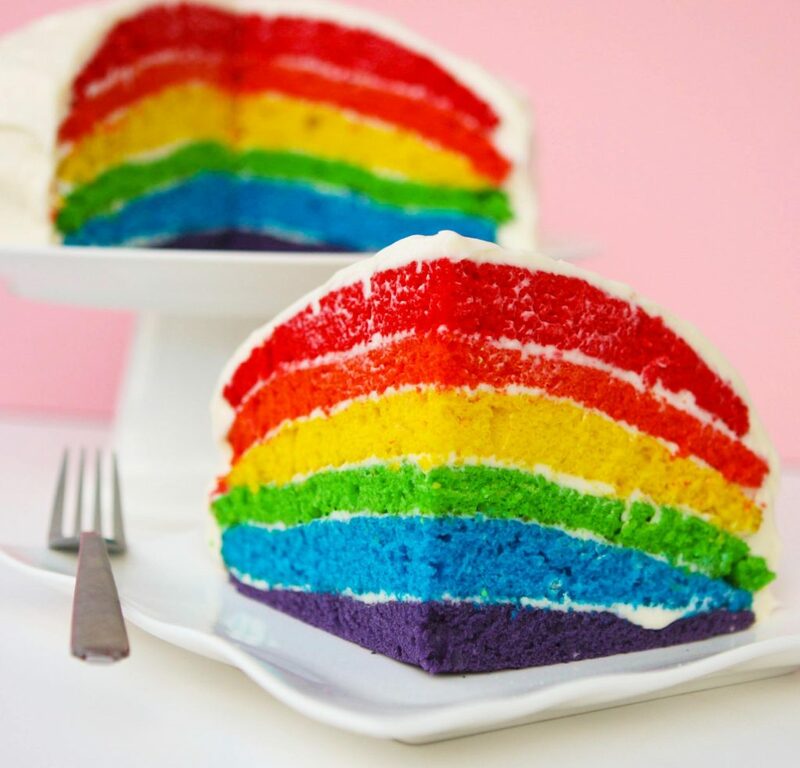 I have seen many recipes for rainbow cakes, but this one is my favorite. It doesn’t require a lot of ingredients and the result is amazing! Thanks for sharing! Gorgeous pictures by the way! What a gorgeous cake! I am a big fan of Pip & Ebby, and this is just one reason why! I can’t wait to try rainbow cake, I know my son will love it! How pretty! This is happiness in cake form. Lovely guest post Megan! And Chef Dennis, I’m with you, enough with the rain! Oh this makes me smile. And it makes me hungry. Another great guest post!! Megan- you rocked this cake! Ok…this is bringing me back to childhood! !…..Rainbow cookies that you find in any Jewish or Italian bakery are my all time favorite! And this reminds me so much of it. I MUST do this recipe and am bookmarking as I type. Thank you so much! How much and colorful!